During the International Hearing Society’s annual convention this month, members of the EarQ team reinforced the company’s passion for fostering independent practice growth and discussed how its unique business resources can support their development in communities nationwide. Syracuse, NY (September 15, 2015) — On the cusp of a major expansion, the International Hearing Society (IHS) invited EarQ, another growing organization, to share its passion for supporting the success of independent hearing healthcare practices with attendees of this year’s IHS Convention from September 10-12. 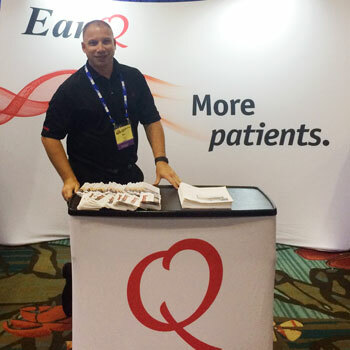 Throughout the event in Orlando, FL, representatives of EarQ discussed how its suite of innovative business and marketing solutions can help practices stand out from their competition and improve the lives of more people within their communities. Most talked about were EarQ’s patient-driving programs including Iris, its innovative responsive internet strategy, the EarQ Family Hearing Plan, the Hear Like a Pro Professional Athlete Hearing Care Program, and the EarQ 4-Year Warranty. “We are constantly working to evolve our programs and create better solutions for today’s practice owners to maximize their opportunities for success,” said Ed Keller, president of EarQ.